The USDOL-funded global Country Level Engagement and Assistance to Reduce (CLEAR) Child Labor II project is a capacity building project that works with host governments in Liberia, Nepal, Burkina Faso, Panama, Jamaica and Belize to address child labor issues. 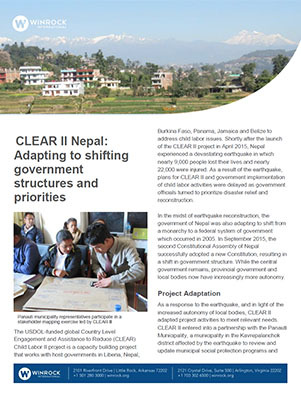 Shortly after the launch of the CLEAR II project in April 2015, Nepal experienced a devastating earthquake in which nearly 9,000 people lost their lives and nearly 22,000 were injured. As a result of the earthquake, plans for CLEAR II and government implementation of child labor activities were delayed as government officials turned to prioritize disaster relief and reconstruction.